Four Los Angeles Jr. Kings - Alex Bonrouhi, Danny Minnehan, Brandon Plaga and Riley Ruh - were selected in this year’s USPHL NCDC Futures Draft, which was conducted yesterday. 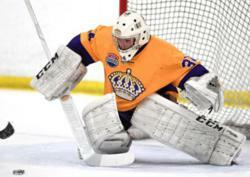 Four members of the Los Angeles Jr. Kings were selected in this year’s United States Premier Hockey League (USPHL) National Collegiate Development Conference (NCDC) Futures Draft, which was conducted yesterday. The players chosen included forwards Danny Minnehan and Riley Ruh; defenseman Brandon Plaga; and goaltender Alex Bonrouhi (pictured). Minnehan was selected by the New Jersey Rockets; Ruh by the Maine-based Twin City Thunder; Plaga by the Massachusetts-based South Shore Kings; and Bonrouhi by the Connecticut Jr. Rangers. All 2003-born players, Minnehan, Plaga and Bonrouhi play on the Jr. Kings’ 16U AAA team; Ruh skates for the club’s 15U AAA squad. The USPHL’s NCDC is a 12-team tuition-free junior hockey league located entirely in the Northeastern United States. The league and all of its teams position themselves as fully united and dedicated to the mission of player development and advancement to college hockey.